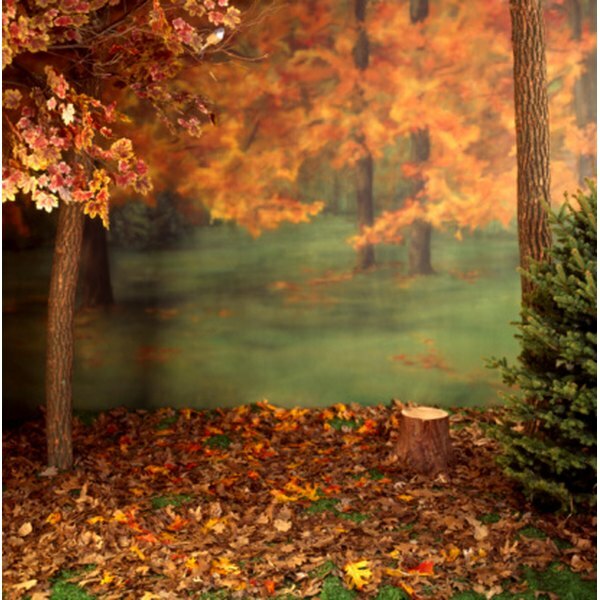 Design an autumn-themed backdrop for your festival's photo booth. From back-to-school to Halloween or harvest themes, fall festivals offer an opportunity to host fundraisers or hold more engaging parent-teacher nights. Add an activity that doubles as a souvenir station with a photo booth that attendees can customize. Offer simple backgrounds like piles of leaves or pictures of blackboards, or create more elaborate backdrops with classroom scenes, pumpkin patches or Halloween landscapes. Include the school mascot or local landmarks for extra flair. Use old desks, books, globes and other classroom materials to stage a schoolroom scene for your backdrop. Decorate the booth itself with pencils, rulers, miniature chalkboards and cutouts of letters and numbers. Use an oversized blackboard or blackboard-like contact paper to make a background that can be customized with names, decorations or doodles for each photograph. Use foam craft or wooden picture frames for the photos and have them pre-decorated or allow attendees to decorate their own. Print photographs in the booth as giveaways or sell sheets of photos to each family. Graveyards, ghosts, jack-o'-lanterns and black cats create a chilling Halloween landscape for your festival photo booth. Pose guests on top of papier mache- or real pumpkins, next to spooky skeletons or grinning ghosts. Hang rubber or paper bats from the top of your backdrop to add depth and offer guests the opportunity to don costumes or face paint for added fun. Fog machines bring an ethereal glow to photos, while black lights or strobe lights create interesting visual effects. Decorate your booth to look like a graveyard, with foam tombstones set up around the perimeter. From piles of leaves and pumpkins to hay bales and scarecrows, a general autumn theme is ideal for younger elementary children or festivals at religious or parochial schools. Baskets of gourds and squash, bundles of corn stalks and artificial and fresh leaves create a fun and rustic backdrop for photos. Decorate the booth with leaves, gourds, pumpkins and scarecrows, and have guests color scarecrows and paint pumpkins while they wait for photos. Plain or solid-color backdrops frame students as they pose with their painted pumpkins or personalized scarecrows. If the fall festival has a different theme, such as a carnival/county fair theme, decorate your photo booth with that in mind. Use brightly-colored backdrops and props that coordinate with the overall festival theme so that guests and attendees have a souvenir that reflects the night. Offer costumes and props with your photo booth so each picture is completely customized for the student and their friends or family.